I got stuck at the Disney princesses, what does that say about me? And these quizzes never let you skip any questions. Close but no cigar,said I'm the youngest,I'm actually the second youngest out of eight. I am indeed the youngest, or more properly the younger, since there are only two of us. I think the answer must have been luck, since I had no idea about Disney princesses, Kardashians, or half the cartoon characters, so I just did a random guess. This quiz told me a good bit about American low culture - but since when was Matilda, assuming they mean Roald Dahl's character, from American literature? All right, I know it's not serious - and I admit I do have most of the characteristics of a younger child. They got it right (eldest) but I could have done without the Kardashian question. I have no interest in any member of this useless elitist family. 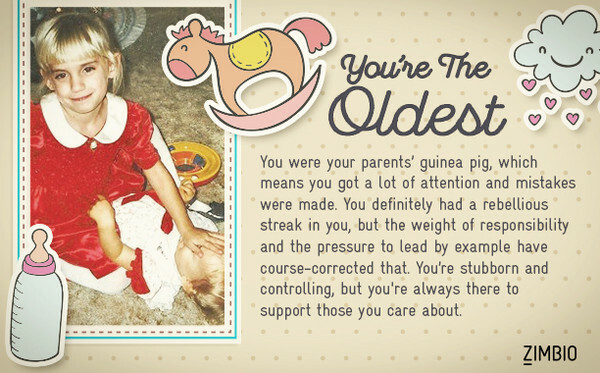 It said I am the oldest - wrong! Two sisters and a brother all born within 3yrs 3mths of each other, then I came along 13 years later. It isn't the date on your birth certificate that ages you - it's your frame of mind. It said I was the oldest but I'm the youngest with 16 years gap between me and the next one to me. Be kind now so you're not sorry later. It said I was the youngest, but that's ok - I have no siblings. I got the eldest - but I'm the youngest of four. I got middle. I'm the eldest of two. I got youngest.I am six years older than my sister.